I don't think the democrats realize the resentment there is over the "you earn it , we'll spend it" attitude they have. If Texas goes, they won't be alone. Why don't they get away from the cities for a minute and come talk to the hard working Americans. They would get a better idea of what people really think. Ron Paul, like most libertartians, is out of touch with reality. His comments sound plausible in theory, but he never works out the practical implications. We need libertarian philosophy for the power of its critique but not as a prescription for how to actually run a government, because it does not have such a prescription...never will. I don't know what Center Square's diatribe was about–Texas secession and Democrats? Fragile thread, there. Obviously venting. But, okay, go ahead, secede. I wonder how many class action suits will follow, or legal methods used to get returned to the national coffers the millions that go to disaster relief or Texas pork projects–or those on the books or disasters to come. Are Texans able to cover such costs along the coast–or would they even want to? Secession is good only because U. S. citizens won't have to pay for guarding the border anymore. Are there enough Texans to use the products of all those refineries? Gulf oil will flow through another state to where the money is–i.e., everywhere else in the U. S. Secession didn't work during the Civil War, and it won't now. It's goofy to consider having to use a passport to get into Texas–but it would also necessitate using one to get out, too. Secession is a bad idea, and secessionist Texans have a very narrow view of it. Has the Republican party forgotten that they were the ones that called for an over the top stimulous package in the fall of 2008 while Bush was still in office? They were also the ones who wanted to start bailing out AIG and the banking system during that period of time. How is it that they are now blaming President Obama, a man that was voted in by the people? It is irresponsible for Representative Paul to compare the seceding of Texas to those countries who became independent of the Soviet Union following its collapse. Under one, you have a dictatorship that took over that country and provided little for the people and gave them little freedom. Is that what is going on in Texas? You can't get more UNAmerican than secession. I had to put up with Bush nonsense for 8 years, he didn't cut spending AND destroyed our foreign policy. spineless turncoat. We as a Americans can fix this but it would not be politically correct.We need to take care of americans,legal and naturltized citizens. Any other do not get any , none , no benifits from the local state or federal goverment that would save according to washington post and homeland security the illegal aliens,not un documentated workers, have taken more then 500 million per year from the americans and some is sent back to the countries which they originate from we need to take a lesson from denmark. the persons in prison which are getting socal security,fedral benifts there familys getting SSI make a prison a place not to go to not to . I have a few questions for the president if he reads this, and for the rest o americans What happens to the social security money that the aliens pay in . where is the records on the money from bail outs bail out the banks and not the people who make the jobs. where are the brains. we should impeach all of the politations and send them to prison and take all of there money and use it to fix our ecomony. i have talked to some neighbors which are going back mexico and keep there unemployment by using phone in registeration. Being Texan myself and voting for Obama, people need to realize every major city in Texas...Houston, Dallas, Austin and San Antonio all voted for Obama. i believe the final tally was roughly 55% for Mccain and 45% for Obama across the state ...its not like 90% of the state went for JM. To think our governor and some right wing nut speak for all of Texas is insane. The state would never secede and hopefully people don't believe that all of Texas stands for this nonsense. Saying that "secession is very American", and that we should welcome such expression of independence by the states is complete nonsense. I was surprised that Kiran did not mention that many Americans died during the civil war on both sides of the secession argument. That's a blatant historical fact that was totally ignored in this interview. Comparing the Federal Government to King George is ridiculous. What bothers me very much is to observe how dysfunctional and negative (to use a mild word) are the Republicans and conservatives when they are out of power. It's one thing to oppose the policies of the elected government, another to spread nonsense and promote disorder (even going as far as using the term revolution). In a democracy, the opposing party(ies) should learn how to operate within the system in a civil manner, without resorting to illogical and desperate tactics. Why are people so into what the government can do for the people. Everyone needs to stand back and figure this whole thing out. Okay, irregardless of the republicans and democrats, the government is messed up. So, if one state wants to seceed from the Union in order to save themselves from what is happening to this country, so be it. They might be better off governing themselves, that way the people of that state can then decide what is best for themselves, in this case Texas. What is wrong with taking our country back and saying no to government, republicans and democrats alike. Everyone needs to stop saying republicans this and democrats that, gather together as a United front and say "NO". To me, that is what it boils down to. I didnt vote! Dont tell me my vote could have made the difference either "free-spending Democrats and Republicans". Secession was always supposed to be an option. Its what are founding fathers wanted and new we needed to keep the govt from turning into a bunch of gangsters in the pocket of the bankers. Center Square, I agree that the American people are getting what they asked for all these years. The current state of affairs is the predictable outcome of decades of deficit spending and increasing debt in the economy. The question is how do we reform this government? It looks less likely every year that it can be done peacefully through the electoral system. People are still calling Ron Paul a crank for predicting the collapse of the dollar, but that is exactly what's going to happen. The federal government cannot keep the entitlement promises it has made, and it will not be pretty when rank and file Americans wake up to that reality. Texas secedes, we will move there until the traitor is out of the Whitehouse. Obama releases memos on waterboarding and blacks out, and won't release facts on waterboarding thwarted 30 ATTACKS ON GOOD DECENT AMERICANS. Guess whose side Obama is on folks ! He likes the terrorists/barbarians. Excellent idea, Texas. I'm certain you will be much better off without us. Why, you even have your own little dictator ready to pick up where he left off. I'm sorry how are we neglecting the Civil War when we discuss seccession. 6 million Americans died deciding this – states may attempt seccession but it is an act of war, an act of treason. It is not treasonous to discuss it because of the 1st Amendment but action absolutely is treason. You Obama lovers are insane. Bush running up the National Debt? We were at WAR you idiots! President Bush had to make hard decisions to keep us safe. Apparently you didn't appreciate the last Eight years of no attacks in our country? How does President Bush's 489 Billion Budget even come close to the 9.3 TRILLION ...(That is 999 Billion nearly four times over for those of you that don't understand the difference between a Billion and a Trillion) that Obama is bringing down on us? Not to mention the laws that are taking away your freedoms of speech (hate crime bill) and gives the Homosexuals in this country the power to run around and sue you anytime you don't agree with them. All you people that voted for Obama need to wake up. We are becoming a Socialist Nation and soon after that follows a COMMUNIST nation. Read your history books! Ron Paul states "We used secession, we seceded from England. So it’s a very good principle. It’s a principle of a free society. It’s a shame we don’t have it anymore. " Maybe Ron Paul forgot that we had a small war called the American Revolution for us to secede. Texas did secede once before and fought for that right and lost, it was called the Civil War. I'm a Ron Paul supporter, and yes, I think the comparison to King George is absurd. A better comparison would have been the freaking Civil War. But I want to address you people who are calling Dr. Paul nuts. He's not nuts. Neither am I. Yes, some of his supporters are insane, but there are many of us out there who are perfectly "sane." For any of you to say that Ron Paul represents a sore loser of the Republican party is absolutely stupid. First, Ron Paul was the only Republican during the nomination process who actually advocated REPUBLICAN values and traditions, not these bastardized, religion-fueled neo-conservative policies expressed by many who claim to be Republican. Second, maybe you should open your ears. Ron Paul has been chastising the Republican party for YEARS because of its abandonment of some of its core principles. Yes, the comparison to King George was wrong. However, I think the comments by the viewers on this site is more wrong and much more indicative of how absolutely ignorant the people of this country are. Maybe you should do some research YOURSELF before you criticize others for making a mistake. Texas can should secede; every Texan I've ever met always talks about how the rest of the country wouldn't matter to them. If Texas left the union, the average of education standards, air pollution standards and the ratio of natural blondes to bottled ones will sky rocket. They can have Bush, they can have Tom Delay...it's what they want and what they deserve. If they secede we can keep their nuts contained within their boarder...which would have to be patrolled by an armed militia. We wouldn't want any Rogue Texans breaking through the line...smuggling things in like Taylor Swift cd's. Yes sir, I believe we should let them secede and shoot anyone that tries to come over. Wasn't there an experiment in secession already – we called it the civil war? The federal government's response was pretty clear about the possibility of seceding from the union. can i help them pack? I want to know when this type of talk stopped being treasonous? Last time I checked session was against the law. Andrew Jackson had the right idea when it came to secessionists. Highly amusing. Good luck producing anything in that arid of an area. They'd be begging on their hands and knees the first moment they needed food or aid. What a bunch of morons. we are proud to be texans and americans. we are not going any where.. remeber the most successfull stratagy... devide and conquer. we know very well that if we devide we will surly fall. secession is bunch of bully talk thats all that is. GOP is mad that a republicans are not in the office right now, and they cant take it. bunch of idiots. insted of crying about the situation.. bring a better solution to the table and lets pick our contry back up and show the world that when america puts its might in to it. we can beat any odds. .. after all we are americans dam it. and dam proud to be one. This is not my government. I did not vote for it and it lacks for the most part any resemblence to the founding institution of the U.S., and has nothing to do with the Constitution, hence, this is not my government. "It is incumbent on every generation to pay its own debt as it goes. A priniciple which if acted on would save one-half the wars of the world"
" I predict future happiness for Americans if they can prevent the govenment form wasting the labors of the people under the pretense of taking care of them"
"The strongest reason for the people to retain the right to keep and bear arms is, as a last resort, to protect themselves against tyranny in the government." GOD bless you @ Bill Hamlin! My sentiments exactly. For those of us who are not represented by those that the majority elects, the threat of succession is a desperate attempt to find a tool to reign in a federal government that is operating well outside the constitution. A better tool is just to move to a better run country and let the remaining citizens that voted for these politicians repay the deficit and live with higher inflation. Whether you want to use the word secession or not, we did break away from England which is the point he is making. And this is something worth discussing just to point out the overreaching of the federal government, even if it's unlikely to happen. Saying someone is nuts without backup or argument doesn't carry much weight with thinking people. Also to point out the history, unlike the other Republicans, Ron Paul's message has been the same when the Republicans were in power as it is now. In fact, the Republicans black-listed him. They are hypocrites, he isn't. All secession talk aside for one moment. I need to clarify that George Bush (dad and son) are not FROM Texas. They may live here now but they are not a product of this state and never will be. George W Bush's cowboy act was exactly that -an act. Everybody equates people at the tea parties and those against irresponsible spending right now as Republicans only and where were you when Bush was in there. I said the same thing then. We've been spending irresponsibly for years and years. We're against BOTH parties spending that way. Do I have to be on one side or the other? I'm against reckless spending regardless of which party is doing it. You guys do know that Ron Paul was not a supporter of the Bush Administration, right? He was among its staunchest critics... so speaking of ignorant! Spare me the Bush comments. That copout can't be used in all political discussions regardless of the topic or speaker. This country was founded on the idea of self-government, which is what secession is all about. Does anybody want to refute that basic point instead of attacking the messenger or going into Bush hysterics? Tallk of secession in Texas when we have first black president...hmmmm. For goodness sake, let's stop talking about it and draw up the paper work. Bye bye, Texas. Ron Paul shows his true colors as an anti-Union secessionist who would reopen the Civil War. Traitor! Perhaps my memory fails me but I thought the U.S. fought a four-year war to prevent the secession of several Southern States–including Texas–in the 1860s. The talk is just that......talk......yet Texans expect Washington to take notice, as we are saying "we aren't happy with how things are going". There are plenty of other places, that aren't happy as well. The difference between Bush debt of 459 Billion Dollars and Obama debt is that Obama will spend double the money that all the presidents from Geo Washington to present day......people need to research. I'm not from Texas, but can see them making it on their own. First, they would absolutely seal the border. Yesterday Obama ADM denied Arizona troops to stop Drug Cartels from crossing the border, etc. WHY? Because the Gov't, politicians are involved in kickbacks and payoffs from drug dealers......yes they are involved; and per person involved in that aspect of it on TV last week. My Bro has always said that – now right from the horses' mouth. Somehow our protests must continue and we must kick the Congress and Present ADM out of Office ASAP or we will be a third world Country. Obama is about Control/Socialism/Fascism, and not about America and Democracy. Look at the record of his appointees and those that were acutally caught in their fraud and stopped from becoming a cabinet appointeee (unbelievable folks). Obama is a world citizen and not an American. He has six siblings and they all live in Kenya, and so why would he not want to soft soap the terrorists. Americans should be embarrassed at what they have done to America insofar as ADM this time. 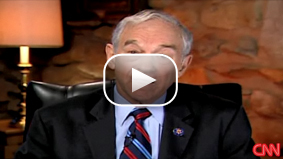 Ron Paul states the colonies essentially seceded from Great Britain and that's OK. Using his logic then, it's OK to tar-and-feather our public officials and cause general anarchy, which was also prevalent prior to the revolution. If I remember my history correctly, the colonies were protesting that they had no representation and therefore cannot be taxed and similarly oppressed. Well, the nut-jobs protesting at the tea parties need to realize that they are now and have been represented all along. They were protesting tax increases (and other things) simply because they don't want to pay more taxes. It's fine to protest, but to secede? C'mon... Get real. Secession should have been on the table a long time ago. As for the guy who said "we" did this to ourselves, please speak for yourself. I am not a part of your "we". I never voted for these people over the last 30 years. The Free State Project has been talking about this for a very long time. freestateproject.org. Check out Free Talk Live. Check out FreeKeene.org. Dont be a slave all your life. Fight for your liberty. Everyone in this room needs a history lesson. WOW! How dumb are you people? Even in monarchies the royalty rules at the consent of the populous, even though they are not voted in. There have been several revolutions to back that up. What form of head the snake has doesn't matter so much as how much bite he has left. As Franklyn said "Might shites on the back of right" or "might makes right". The Federal government though pretty much bined still carries a very large stick and has a propensity to use it. Not that a civil war is looming but I could imagine national gaurd troop sent out to stop so called rioting and looting, even though the constitution has provisions against using federal troops within our boarders. The loop hole is National gaurd is state based and states are allowed to maintain a militia. But who will be giving the orders our governors or the president? I agree with mr. paul. If the federal government keeps violating the 10th amendment rigth of the states they have every right to suceed. I take great offense to "the center squares" statement that it is the American citizens fault that we are in this mess.Its not like "we" have much of a choice when it comes to polotics in a 2 party system and considering Obama is just perpetuating most the Bush's policy's including the patriot act there dosn't seem to be much of a difference between these two "foes". Can't we hang both Perry and Paul for making comments like that during war time? Maybe you'd be happier if they just burned the flag? It IS time we divide up the United States. I want to live in a country that celebrates Judeo-Christian values. I want to live in a country where people must pull their own weight...I'm tired of paying for generational sloth. I want my borders respected. I want to live in a country that controls its spending. I don't want to live in the United States, I want to live in AMERICA. Bush is not a friend of people who support the views of Dr. Paul. He was leaning in the same misguided direction. Think about other people's views with an open mind and stop spouting the same rhetoric over and over. Is this really Ron Paul?? I always liked alot of what he had to say but this is just stupid. No one raised any constitutional concerns when New England seceded?? Really ??? Maybe because we didnt have a constitution yet !! Sorry but a governor talking about secession should be removed from office and imprisoned as a traitor. If you're not happy with the curretn government, the constitution (something i always thought RP loved) provides a "constitutional" manner to replace the government. Thats what RP needs to be talking about. Gosh, from the party that gave us Freedom Fries and "if you're not with us you're agin us" rhetoric for 8 freaking years, can you wait at least one year before you secede? 1) Does Mr. Paul then think that the Southern States were correct in their attempts to secede from the Union in 1860-61? That Lincoln was wrong for going to war to save the Union? 2) No one challenged New England's attempts at secession as unconstitutional because, when New England was seceding from Mother England, a monarchy, the Constitution, of course, did not exist. I do hope that people are not duped by such mindless rhetoric. Mr. Paul is a scary, scary man. Doesnt matter when Pelosi/Obama bankrupt the nation the country will most likely be broken up anyway. And just a history lesson for Mr. Paul - didn't the U.S. Civil War establish that the policy of our federal government is not exactly pro-secession? Texas – please go and create your evangelical country. Give Rush an office. Texas talks tough but you better learn from history. You did not defeat Mexico (A weak adversary compared to the USA) on your own without the help of the USA and you know what happened to the South during the Civil War. So be warned. Its always great to see Ron on CNN– but no one was talking about secession in the first place. Lets talk stay focused on our fleecing by the federal governement over the last 30 years and the loss of civil liberties we have incurred in the name of safety. Just remember, if we leave we take part of Oklahoma and Colorado, all of New Mexico and the state of Chihuahua. The Fourteenth Amendment to the Constitution forbids elected officials who have sworn an oath to serve the United States from holding any office when they engaged in insurrection or rebellion. Succession is treason against the state. A second civil war is not what this country needs and anyone who supports is is supporting treason. Frankly, under the constitution, Gov. Perry, congressman Paul, and ever member of the TX state legislature who is seriously proposing secession should be stripped from office unless pardoned by a two thirds vote from each house of congress. "No person shall be a Senator or Representative in Congress, or elector of President and Vice President, or hold any office, civil or military, under the United States, or under any State, who, having previously taken an oath, as a member of Congress, or as an officer of the United States, or as a member of any State legislature, or as an executive or judicial officer of any State, to support the Constitution of the United States, shall have engaged in insurrection or rebellion against the same, or given aid or comfort to the enemies thereof. But Congress may by a vote of two-thirds of each House, remove such disability. " Did Ron Paul and Kiran Chetry forget that there was a little issue about secession that caused the Civil War. We as Americans haven't "endorsed secession all along" as Ron Paul claims. We had a MAJOR war about a state's ability to secede from the union when it disagrees. Of course in the 1860s, about half of the states did endorse the idea but the other half went to war over the idea. I think we have a very mixed history on secession. Put this guy in jail.....what he is talking about is war, war between americans....lol, what a line of crap. Not only did we move to a whole new continent when we seceded from England, but it caused war even then. This guy ought secede to the moon please. The (wrong) Right will vilify Obama no matter what. If he takes decisive action, he's oppressing us. If he stands back, he's a wimp. Down with Obama! "He's a wuss and/or tyrant!" So sad, and so scary. I'm deeply worried for the future of this country. Keep talking seccession Texas! Does the Governor of Texas and Ron Paul consider the consequences? Left alone as independent from the US, those Txas folks talking seccession will be at the mercy of Mexicans! Oh my God. Imagine, all those white Texans, at the mercy of Mexicans? Do these people relaize that they will be a small minority in State that is largely Mexican? Forget defense from the US, the current border issues will be meaningless Texas will become its own third world country. I say keep talking seccession and why your at it, why dont you talk to the folks in Florida, who secession would be equally pleasing. To those that believe that our 'nation' will continue as it is today, you are deceiving yourselves. We are a seriously divided nation. Secession is untimately the only answer. To my view, this talk of secession is nothing but crowd-baiting populist rhetoric, meant to endear Gov. Perry to a fringe of his base. It would be more valuable for Rep. Paul and Gov. Perry to consider the lessons of the Civil War, rather than to ramble on about oppression under the British Monarchy. I believe that the Civil War still represents the greatest loss of life in any conflict in our history. The entire war was centered on the notion that a freely elected representative federal government does have the right to steer the direction of the country. While Texas could choose to divide itself into 5 separate states within the U.S., it has no right to secede. I believe it is irresponsible incitement for elected state and federal officials to give any credence to the notion that any state can secede from the Union. Both the Governor and Rep. Paul ought to be voted out of office for their ridiculous stance and their lack of appreciation of the role of the federal government in history. I think it's a scary thing to openly discuss, but we can't forget about freedom of speech. I wonder what kind of a country we would be if the state and federal government were equal partners? We could call it "seperate but equal." Wait a minute; isn't that what's supposed to be happening now? Texans would be far better served if they exercised their (clearly documented) right to split into five states than to keep talking about their (ambiguous) right to secede. Texans could then form their own political party and play Dems and Repubs off each other as small parties in other countries do – brokering which main party would run the government as a whole. And AMEN on the bank bailouts, Ron! We gave them a ton of money and suddenly they are doing better? Is this seriously a surprise to anyone? Give me just $1Billion and I'll so better, too. It sounds to me the Liberals are the angry ones in the country. They're angry when Bush was President, and they're still angry with Obama. They accuse others of hatred, yet their words speak to their character. There was no constitution when the colonies seceded from England! The North was pretty violently opposed to secession when the South wanted to secede. Secession is treasonous you dolt. Is this guy from planet Earth? And to think Ron Paul seemed to be the only republican candidate running for president with at least half a brain.... We now know differently. How can you have a reasonable discussion about secession without mentioning the Civil War? Please, oh please – let Texas Secede! Think how much better the rest of the country would be! Comparing a monarchy to a democratic election...Every time I remember a Republican with a "Sore/Loserman" bumper sticker after the 2000 elections I can't help but think about how ironic it all is now. Ron Paul is a nut. I'm so glad I didn't hop on that band wagon that a lot of people did in 2008. Secession is not American. The colonies did not succeed from England. We declared independence. The colonies had no representation. Texas does. Get over the fact that Obama's in office. We the American people voted for him. seems the previous administration of 8 years, a man from the state of Texas neglected the infrastructure of this nation. Now the governor of that same state is not happy with the conditions. Well, look in their own back yard to the town of Crawford for their answer. As a state that was responsible with it's budget, and with net outflows feeding the increasingly socialist, soft fascist state, I think Texas would do far better than it is currently were it to leave. For one thing, all the workers there would immediately get a 30% pay raise, as federal taxes disappear. We would no longer be subjected to the foolish bailouts and perverse incentives that Washington has created for banks (ie take the maximum amount of risk, and we'll bail you out if you fail), and would shield her citizens from the inevitable collapse of the dollar. Remember, Obama cut taxes, but he's spending at an all time high. How is this possible? The answer is simple, he's printing money. At this point, if the banks start lending their reserves again, fractional reserve banking will kick in, and those dollars will be multiplied (at least) tenfold, meaning the ten trillion or so of bailouts will become 100 trillion dollars in the economy. Our current monetary base is about $300 billion. You do the math. Zimbabwe, here we come. Texas should take the first opportunity to escape that fate, as should any other net payer of Federal taxes. You express outrage by voting. That is why the Republicans are out. The Republicans express outrage by talking of secession. It is the most cowardly, anti-patriotic expression of outrage possible. Shame on you Republicans – your party is toast! The state the spawned W, oh sweet Jesus, please go! Can we expedite the secession? I agree: nonsense. But, should secession re-occur, I would invite Sen. Paul to re-examine what happened the last time, in case he actually believes a desired outcome would be possible. your "vote" is for a bank sponsored political derivative choice of coke over pepsi. obama / bush = two sides of the same coin. This conversation is simply NUTS. We're in the midst of several crises that were the result of policies that allowed certain people huge amounts of proft at the expense of this country's overall well-being–and now that the people have spoken, we hear this kind of crazy talk and inflammatory nonsense. Let's call it what it is: crazy, un American garbage. And the news media would be serving us better by choosing other stories to share or not privileging these lunatics. Check out the latest Economist for a salient critique on the 24/7 news media. Kinda wish Texas would secede! And Honestly Ron Paul make s a lot of sense. Yes WE voted for these democrats and republicans, but as for the average moron in America, do you think hes going to research third party politics when Libertarians and the like aren't even allowed in the major debates. We as a country vote for who has the most money to campaign. That in itself is the crime. We are not the victims, We will take action when the average man sees through the bullSh@t. That is what he is saying. WHERE WERE THESE MORONS WHEN THEIR FRIEND, BUSH, WAS RUNNING UP THE NATIONAL DEBT. If this were Sean Penn, talking about California seceding, the conservatives would be vilifying him. Where's the outrage for this un-American discussion? PLEASE PLEASE !!! Texas, go away please leave,!!! This dude is nuts to ever say such a thing. I think Washington should teabag him and those that agree with the succession of any of our American states. Funny how "treason" in 2000-2008 suddenly becomes "American" in 2009! Good riddance, if you ask me. They can take their high and mighty attitude and play in their own sandbox. If Democrats had spoken about secession in the Bush years there would have been outcries of "Traitors" and "Hang them." What makes you GOP people think you can do this? Divided we fall. Seditious actions in time of war is a capital crime. How come when Bush was in the White House no one talked of succession? If there ever was a time that I was not proud or happy to be ruled as we were that was it, yet I never thought of puling out of the country. It's kind of like "if I don't get my way I'm not playing with you:. That's five year old talk, not rational adult thinking! We didn't "secede" from Great Britain. Not enough space to explain how ignorant that usage is. Would expect better from Ron Paul. Oh, please. Texas is not going anywhere! And as for King George, last time I studied history, King George wasn't voted in by the people. How ludicrous is the notion that all this somehow happened TO us, that we are the victims? WE voted for the free-spending Democrats and Republicans. The poltiicians who have spent 30 years spending us into oblivion did exactly what they said they would do in their campaigns. WE gluttonously accepted the tax cuts that left us with $12 trillion in federal debt. We were not betrayed; we got exactly what we asked for. We stupidly allowed ourselves to believe the federal government could simultaneously spend more and more and more, and tax less and less and less, and the party would never end.